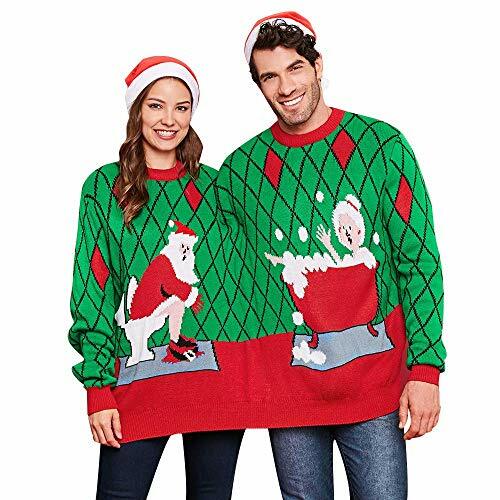 If you are looking to win your couples xmas sweater contest this year you've come to the right place. 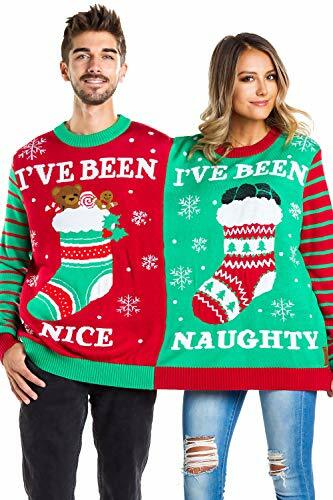 This couples ugly Christmas sweater features the words naughty and nice on the front and is sure to get you a ton of laughs this Holiday season! 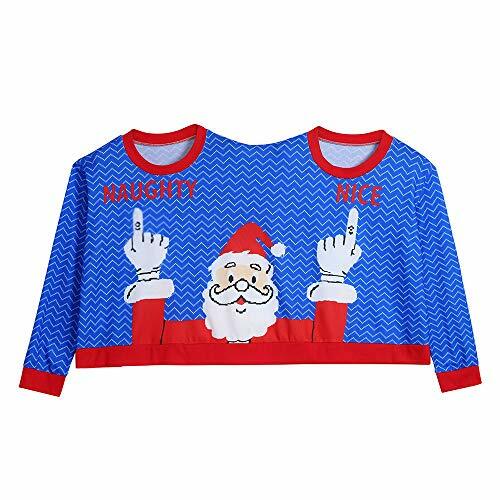 Specification: Type: Pullovers Material: Acrylic,Spandex Sleeve Length: Full Collar: Crew Neck Style: Fashion Pattern Type: Print Package Contents: 1 x Sweater Size Measurement: One Size(Fit US 4-8)--Bust 202cm/79.52"--Shoulder Width 90cm/35.43"--Length 59cm/23.23"--Sleeve Length 59cm/23.23" One Size (Colormix 3)--Length 70cm/27.56"---Width 100cm/39.37" Please check your measurements to make sure the item fits before ordering. Please allow 1-2cm(0.4inch) differs due to manual measurement. 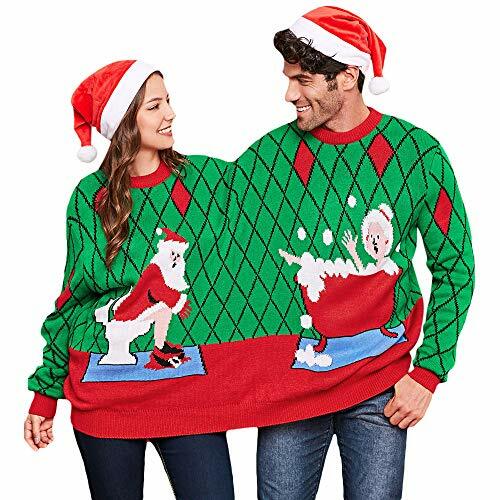 Description: This fun and festive sweater features a Christmas design and even lights up to add some extra holiday charm! 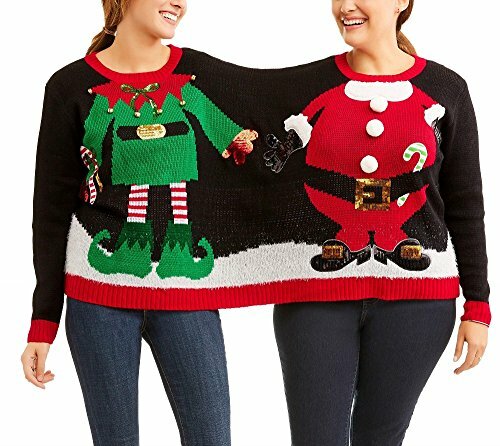 This BFF sweater is perfect for making a colorful and fun statement at any holiday party. The real color of the item may be slightly different from the pictures shown on website caused by many factors such as brightness of your monitor and light brightness. About CharMma: CharMma is committed to providing elegant,fashion and high quality style. Here you will see the latest women's dresses,skirts,tops and more types of clothing. 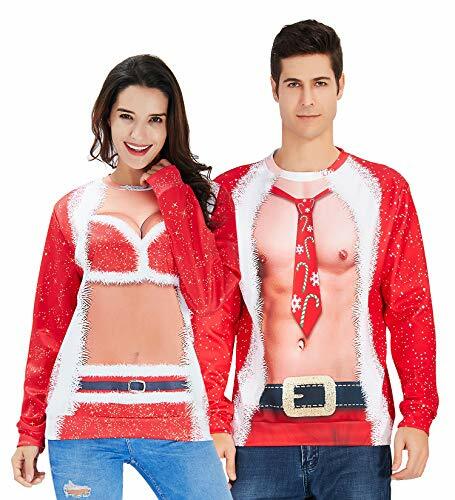 We hope that you can find the clothes make you looks more charming. Size Chart Size:M----Bust:204cm/80.3"----Shoulder:92cm/36.2"----Sleeve:60cm/23.6"----Length:64cm/25.2" Size:L----Bust:210cm/82.7"----Shoulder:95cm/37.4"----Sleeve:61cm/24.0"----Length:65cm/25.6" Size:XL----Bust:216cm/85.0"----Shoulder:97cm/38.2"----Sleeve:62cm/24.4"----Length:66cm/26.0" Size:XXL----Bust:222cm/87.4"----Shoulder:99cm/39.0"----Sleeve:63cm/24.8"----Length:67cm/26.4" Size:XXXL----Bust:228cm/89.9"----Shoulder:101cm/39.8"----Sleeve:64cm/25.2"----Length:68cm/27.0" Product Description: Season:Daily,Casual Gender:Women Occasion:Casual Fit:Fits ture to size Thickness:Standard How to wash:Hand wash Cold,Hang or Line Dry What you get:1 PC Women Top. 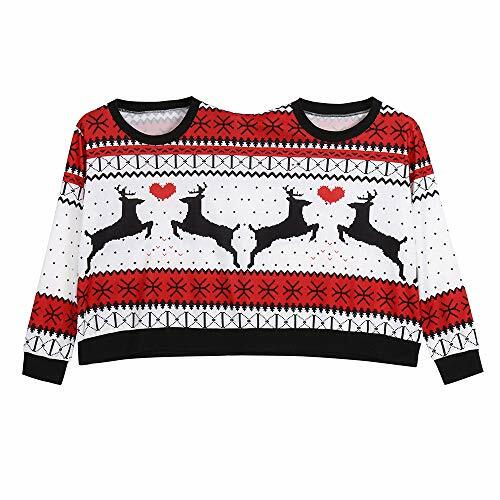 ❤️❤️ Size:MUS:6UK:10EU:36Bust:204cm/80.3"Shoulder:92cm/36.2"Sleeve:60cm/23.6"Length:64cm/25.2" ❤️❤️ Size:LUS:8UK:12EU:38Bust:210cm/82.7"Shoulder:95cm/37.4"Sleeve:61cm/24.0"Length:65cm/25.6" ❤️❤️ Size:XLUS:10UK:14EU:40Bust:216cm/85.0"Shoulder:97cm/38.2"Sleeve:62cm/24.4"Length:66cm/26.0" ❤️❤️ Size:XXLUS:12UK:16EU:42Bust:222cm/87.4"Shoulder:99cm/39.0"Sleeve:63cm/24.8"Length:67cm/26.4" ❤️❤️ Size:XXXLUS:14UK:18EU:44Bust:228cm/89.9"Shoulder:101cm/39.8"Sleeve:64cm/25.2"Length:68cm/27.0"